Glucuronolactone is a small molecule that contributes to the structure of connective tissues. It is an important precursor of ascorbic acid (Vitamin C) synthesis and detoxicant. Glucuronolactone combines with toxic substances and converts them into water-soluble conjugates that can be excreted in urine. It may have hepatoprotective effects in this capacity. Glucuronolactone is approved as a dietary supplement component under provisions of the Dietary Supplement Health and Education Act of 1994. There have been a number of studies measuring the effect of glucuronolactone on diseases. Glucuronolactone is made naturally in the liver. Furthermore, glucuronolactone is naturally found in plant gums. 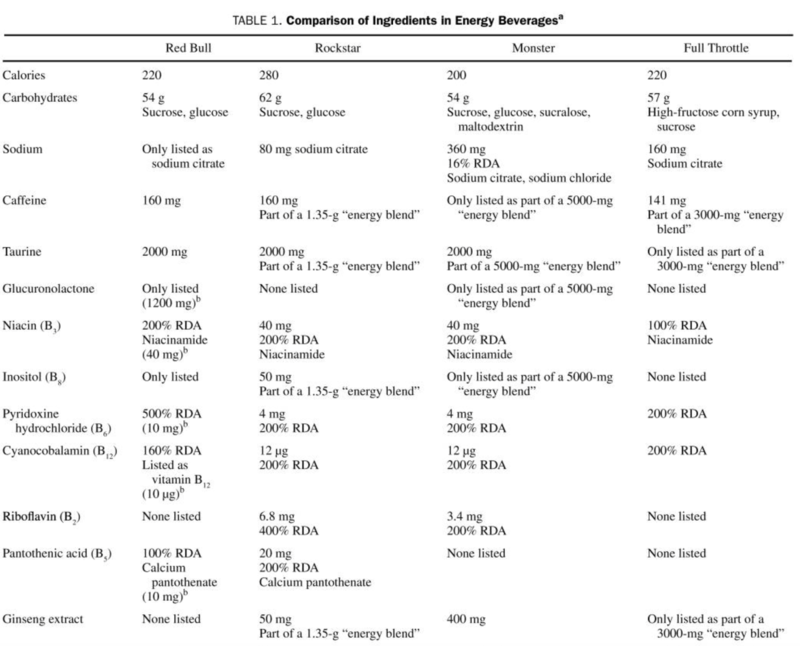 Additionally, it is found commonly in energy drinks.13See table below for common ingredients of energy drinks. Glucuronolactone converts to glucuronic acid and back in the human body. In a normal equilibrium state, there is about an equal amount of each molecule. Functionally, they are interchangeable. Glucuronic acid is an integral part of the pentose phosphate pathway, which is involved in fatty acid synthesis, nucleotide synthesis and amino acid synthesis.14Thus, it is an important molecule for general health. While the effects of energy drinks on cognition have been studied, the molecular physiology of glucuronolactone alone on cognition has not been widely studied, and the exact mechanism of action is not clear. BAKER, E. M., BIERMAN, E. L., & PLOUGH, I. C. (1960). Effect of D-glucuronic acid and D-glucuronolactone on ascorbic acid levels in blood and urine of man and dog. The American journal of clinical nutrition, 8(3), 369-373. Aguilar, F., Charrondiere, U. R., Dusemund, B., Galtier, P., Gilbert, J., Gott, D. M., ... & Lambre, C. (2009). The use of taurine and D-glucurono-gamma-lactone as constituents of the so-called ��__�___energy��__�_� drinks. EFSA J, 935, 1-31. Van den Eynde, F., Van Baelen, P. C., Portzky, M., & Audenaert, K. (2007). [The effects of energy drinks on cognitive performance]. Tijdschrift voor psychiatrie, 50(5), 273-281. Gendle, M. H., Smucker, D. M., Stafstrom, J. A., Helterbran, M. C., & Glazer, K. S. (2009). Attention and Reaction Time in University Students Following the Consumption of Red Bull��__��_. Open Nutr J, 3, 8-10. Alford, C., Cox, H., & Wescott, R. (2001). The effects of red bull energy drink on human performance and mood. Amino acids, 21(2), 139-150. Horne, J. A., & Reyner, L. A. (2001). Beneficial effects of an" energy drink" given to sleepy drivers. Amino acids, 20(1), 83-89. Mets, M. A., Ketzer, S., Blom, C., Van Gerven, M. H., Van Willigenburg, G. M., Olivier, B., & Verster, J. C. (2011). Positive effects of Red Bull Energy Drink on driving performance during prolonged driving. Psychopharmacology, 214(3), 737-745. Reyner, L. A., & Horne, J. A. (2002). Efficacy of a functional energy drink in counteracting driver sleepiness. Physiology & behavior, 75(3), 331-335. Seidl, R., Peyrl, A., Nicham, R., & Hauser, E. (2000). A taurine and caffeine-containing drink stimulates cognitive performance and well-being. Amino acids, 19(3-4), 635-642. Chen, P. J., Chiu, C. H., Tseng, J. K., Yang, K. T., & Chen, Y. C. (2015). Ameliorative effects of D-glucuronolactone on oxidative stress and inflammatory/fibrogenic responses in livers of thioacetamide-treated rats. Journal of Functional Foods, 14, 154-162. Worthley, M. I., Prabhu, A., De Sciscio, P., Schultz, C., Sanders, P., & Willoughby, S. R. (2010). Detrimental effects of energy drink consumption on platelet and endothelial function. The American journal of medicine, 123(2), 184-187. Grasser, E. K., Yepuri, G., Dulloo, A. G., & Montani, J. P. (2014). Cardio-and cerebrovascular responses to the energy drink Red Bull in young adults: a randomized cross-over study. European journal of nutrition, 53(7), 1561-1571. Kopacz, A., Wawrzyniak, A., Hamulka, J., & Gornicka, M. (2013). Evaluation of energy drink intake in selected student groups. Rocz Panstw Zakl Hig, 64(1). Wamelink, M. M. C., Struys, E. A., & Jakobs, C. (2008). The biochemistry, metabolism and inherited defects of the pentose phosphate pathway: a review. Journal of inherited metabolic disease, 31(6), 703-717.